Do you get tired of plain old vanilla spiders and need some more fun and adventure? Well then this is something that you help you out! 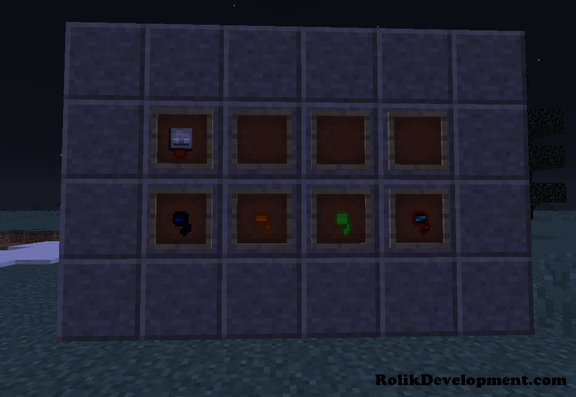 MMSR adds in total 27(29) spiders to the game, and will make your adventures even more epic as these spiders will show you who is the boss, as also now there are more then 20 new types of jockeys and some new epic items! Forest spider has 12 health points and deals up to 4 damage also has 6 armor points. Main spiders attack is poison enemies on attack. 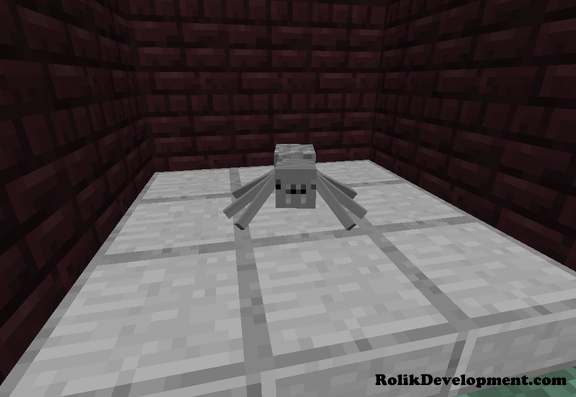 Spider will attack player,villagers, iron golems and spiders from nether and end. On death spider can drop spider eyes,string and apples. Spider spawns in forests,taigas at night and has 30% of spawning. Jungle spider has 16 health points and deals up to 5 damage also has 6 armor points. Main spiders abillity is poison enemies on attack. On death spider can drop spider eyes,string and melons. Spider spawns in jungles at night and has 30% of spawning. Desert spider has 18 health points and deals up to 6 damage also has 3 armor points. Main spiders abillity is casting hunger and nausea on attack. On death spider can drop spider eyes. Spider spawns in deserts and beaches at night and has 30% of spawning. Cactus spider has 16 health points and deals up to 6 damage also has 3 armor points. Main spiders abillity is reflecting 110% damage to melee opponents. On death spider can drop spider eyes and string. Spider spawns in desert at night and has 30% of spawning. Nether spider has 30 health points and deals up to 8 damage also has 6 armor points. Main spiders abillity is setting enemies on fire and being resistant to any fire damage. 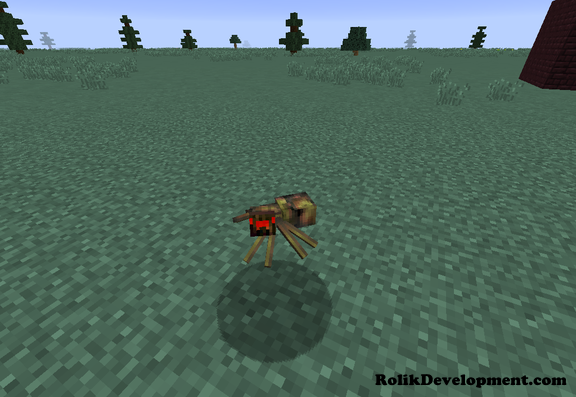 Spider will attack player,villagers, iron golems and spiders from overworld and end. 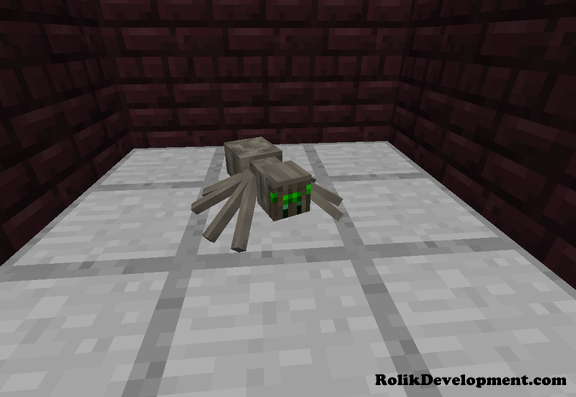 On death spider can drop spider eyes,string and nether warts. 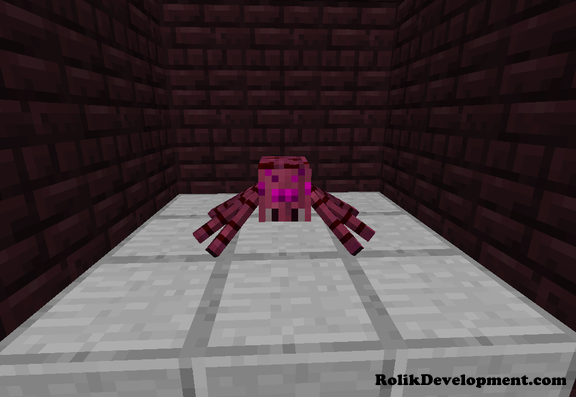 Spider spawns in the nether and has 35% of spawning. 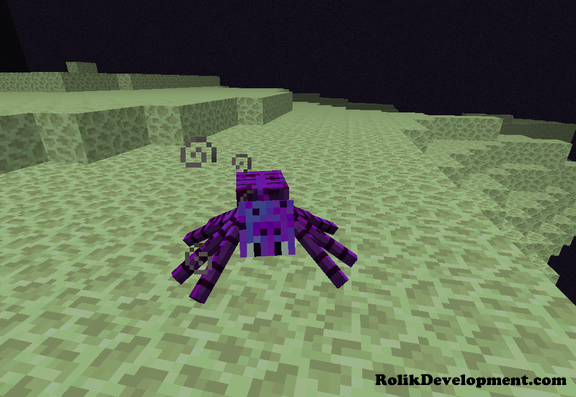 Ender spider has 40 health points and deals up to 10 damage also has 6 armor points. Main spiders abillity is teleportation. 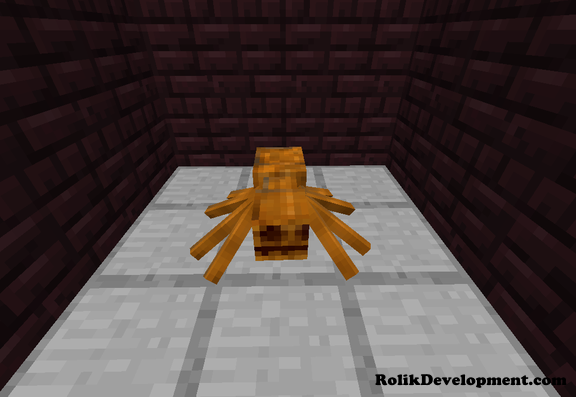 Spider will attack player,villagers, iron golems and spiders from nether and overworld. 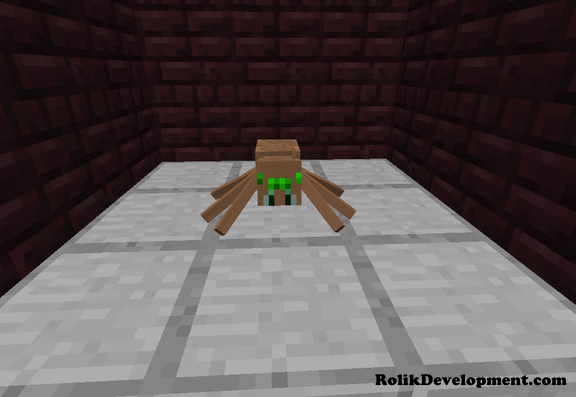 On death spider can drop spider eyes,string and ender pearls. Spider spawns in the end and in any biome in the overworld at night and has 30% of spawning. Snow spider has 32 health points and deals up to 6 damage also has 3 armor points. Main spiders abillity is casting slowness and mining fatigue also leaving snow trail. On death spider can drop spider eyes,string and snow balls. Spider spawns in any cold biome at night and has 30% of spawning. Swamp spider has 10 health points and deals up to 3 damage also has 2 armor points. Main spiders abillity is casting hunger. On death spider can drop spider eyes,string and any type of seeds. Spider spawns in swamps and near rivers at night and has 30% of spawning. Hill spider has 20 health points and deals up to 3 damage also has 8 armor points. Main spiders abillity is jumping on enemies head and bashing it. 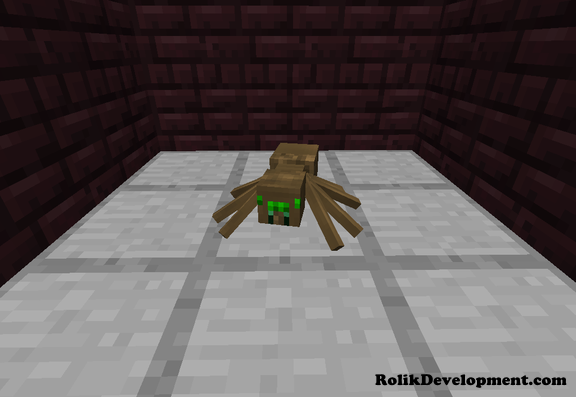 On death spider can drop spider eyes,string and iron ingots. Spider spawns in any hill type biomes at night and has 30% of spawning. Hell spider has 60 health points and deals up to 12 damage also has 10 armor points. Main spiders abillity is setting opponents on fire and being resistant to any fire damage. On death spider can drop spider eyes,string and blaze rods. Spider spawns in the nether and has 20% of spawning. Obsidian spider has 128 health points and deals up to 12 damage also has 10 armor points. Main spiders abillity is setting opponents on fire and being resistant to any fire damage and also stealing 5% of their life. 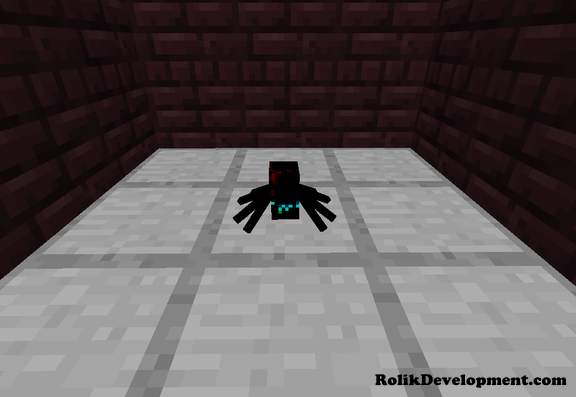 Spider will attack player,villagers, iron golems and spiders from overworld and nether. Power spider has 1 health points and deals up to 1 damage also has 0 armor points. Spider doesn't have any abillities yet. Spider will attack anything that moves and anything that will be bigger then him. On death spider can drop nothing. Spider spawns in any biome at overworld when it's night time and has 40% of spawning. Oak spider has 6 health points and deals up to 2 damage also has 3 armor points. Spider spawns in any oak forests and taigas at night and has 70% of spawning. Birch spider has 6 health points and deals up to 2 damage also has 2 armor points. Spider spawns in any birch forests at night and has 70% of spawning. Acacia spider has 6 health points and deals up to 2 damage also has 3 armor points. Spider spawns in any acacia forests at night and has 70% of spawning. Blaze spider has 26 health points and deals up to 3 damage also has 3 armor points. Main spiders abillity is setting opponents on fire and being resistant to any fire damage also has abillity to float like blaze. On death spider can drop blaze spider eyes and string. 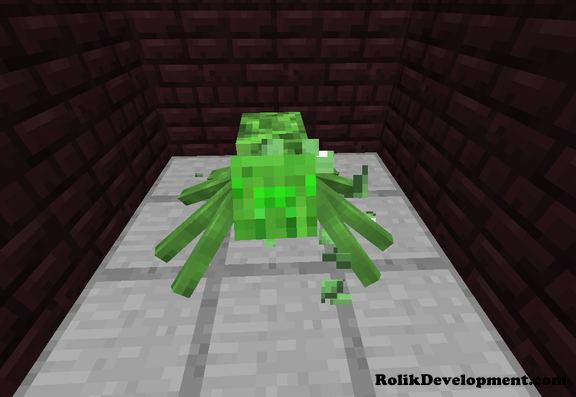 Slime spider has 24 health points and deals up to 1 damage also has 1 armor points. Main spiders abillity is spliting into double and triple spiders on death, also gets less health every split. On death spider can drop slime spider eyes and string also slime balls. Spider spawns in swamps and near rivers at night and has 40% of spawning. Pumpkin spider has 18 health points and deals up to 3 damage also has 10 armor points. Main spiders abillity is life stealing and 20% damage absorption. On death spider can drop spider eyes,string and bones also pumpkin seeds. Spider spawns in plains, taigas and roofed forest at night and has 40% of spawning. 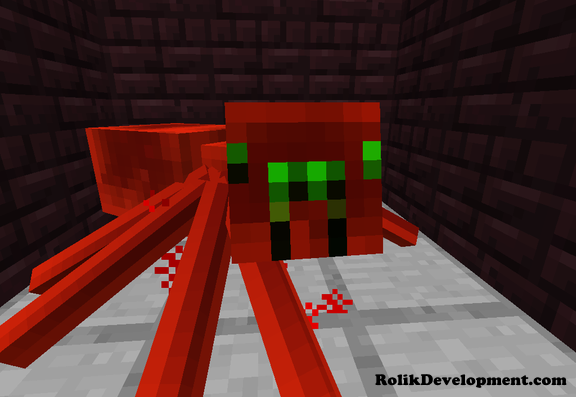 Redstone spider has 24 health points and deals up to 5 damage also has 5 armor points. 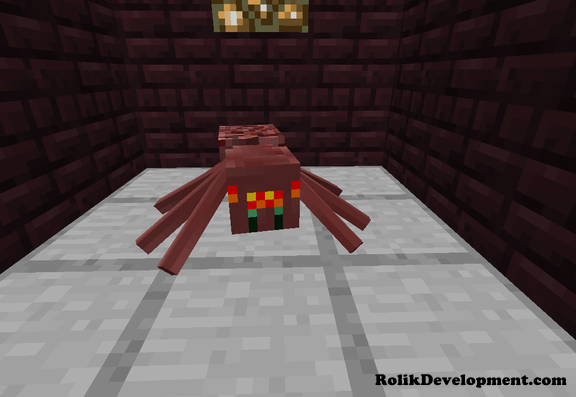 On death spider can drop spider eyes,string and also redstone. Magma spider has 1 health points and deals up to 1 damage also has 0 armor points. On death spider can drop magma spider eyes and string. 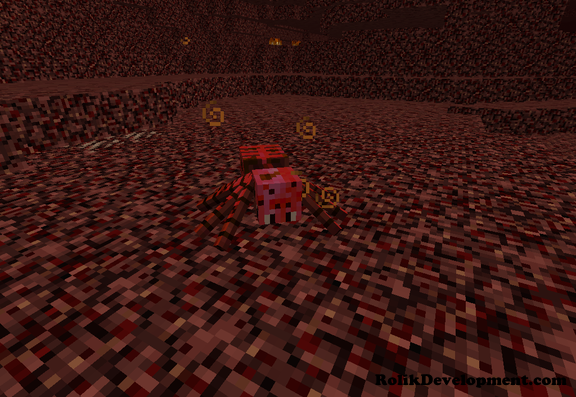 Spider spawns in the nether and has 60% of spawning. Vexus spider has 180 health points and deals up to 24 damage also has 25 armor points. 1.Spawn spikes from the ground(can deal bonus damage). 2.Summoning Baby vex spiders that will deal up to 4 damage and will be able to fly, will die within certain amount of time. 5.Resistance to any fire damage. 6.Flying and resistance to fall damage. 7.Will respawn on death and will become 1.5x stronger if will not be killed in time. Little Vex spider has 7 health points and deals up to 4 damage also has 0 armor points. Main spiders abillity is flying in the air and passing thought walls like ghost. Spider will attack anything that attacks Vexus Spider. 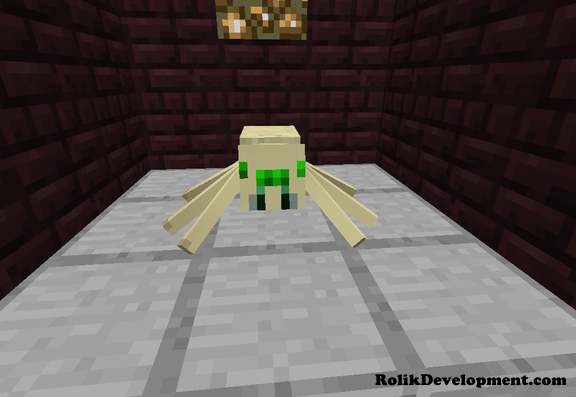 Spider spawns only when Vexus spider will summon them to aid him in battle. Aquatic spider has 36 health points and deals up to 3 damage also has 5 armor points. 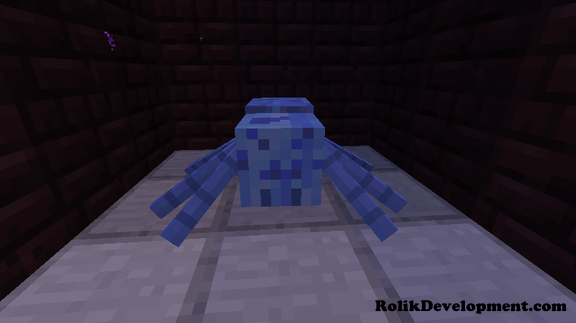 1.Blob Form(will use only in water) - Spider becomes 2x stronger and bigger. 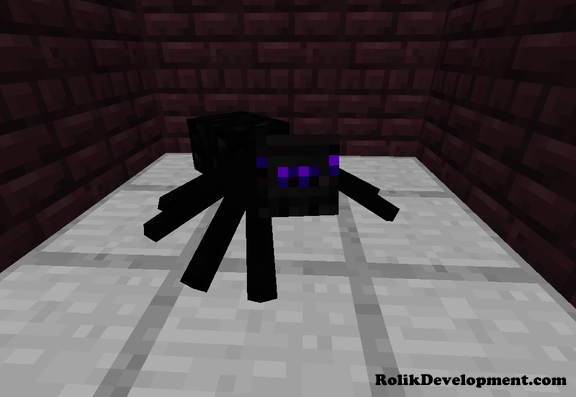 2.Void Form(will use in the end only) - Spider becomes 2x stronger against any end mobs. 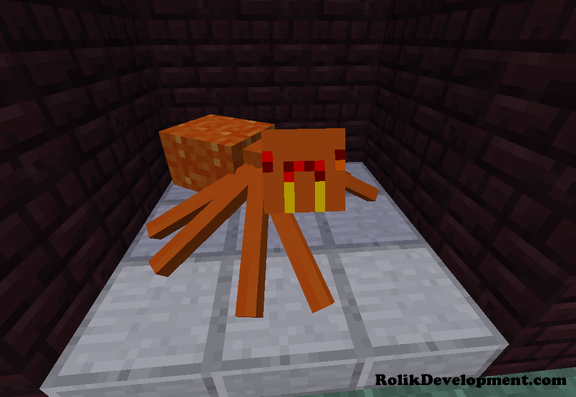 3.Blazing Form(will use only in the nether) - Spider becomes resistant to fire damage and deals 1.5x damage to mobs. 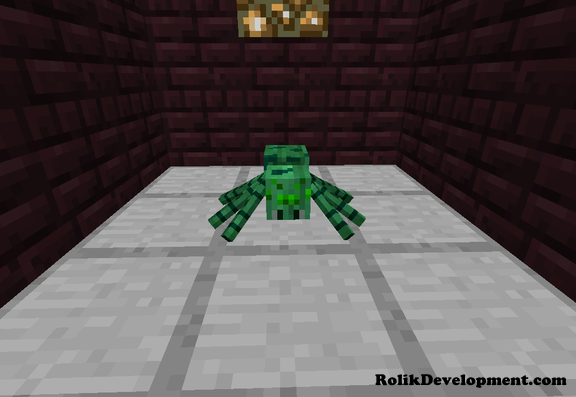 Spider will attack player,villagers, iron golems and any mobs from nether and end. 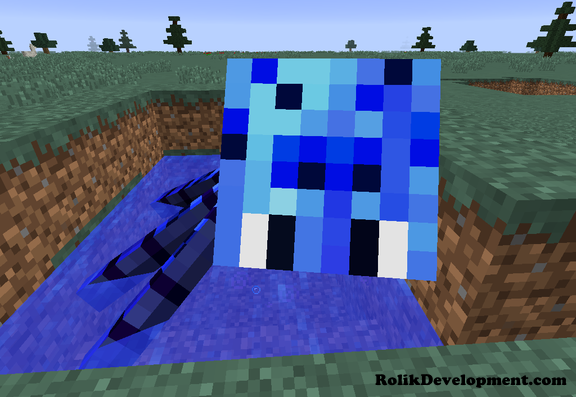 Spider spawns near water in any biome in the overworld and has 40% of spawning. Voodo spider has 4 health points and deals up to 1 damage also has 0 armor points. 1.Binding - On first attack it will bind on to certain enemy and connect to it soul & body. 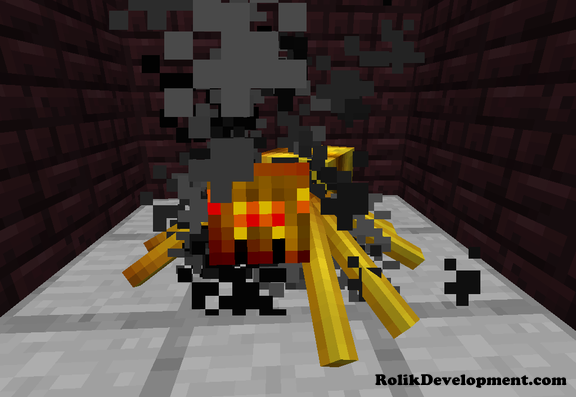 2.Transfer fire - If spider will be set on fire while it binded to someone, that mob/player will also burn. 3.Transfer buffs - If binded to someone, it will transfer to enemy bad buffs and get good potion buffs. 2)Can take up to 125hearts while bound. 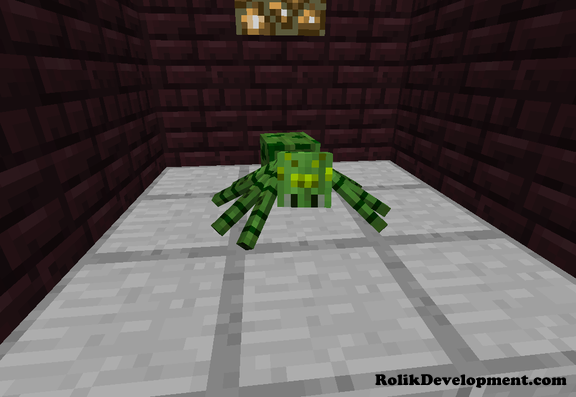 5.Unbound - If player or mob that is bound to this spider kills it in water it will remove bounding from the killer. Spider doesn't attack anyone ,except when they will attack first. On death spider can drop voodo spider eyes and string. 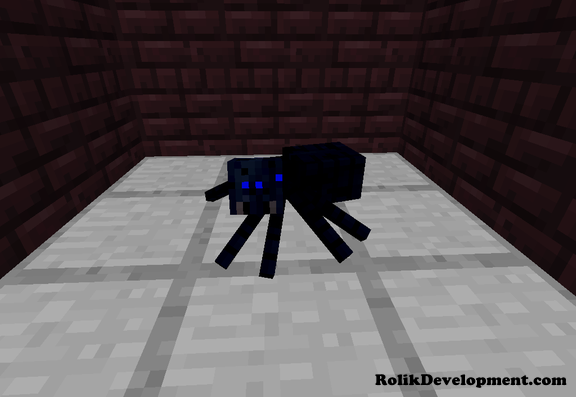 Wither spider has 24 health points and deals up to 4 damage also has 6 armor points. Main spiders abillity is withering enemies and being resistant to any fire damage. On death spider can drop spider eyes and string also coal. Spider spawns in the nether and has 30% of spawning. Cold spider has 32 health points and deals up to 4 damage also has 15 armor points. 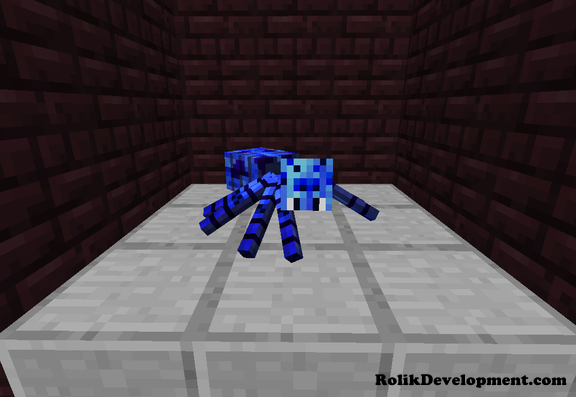 Main spiders abillity is freezing enemies on attack and sometimes transforming water in to ice. On death spider can drop spider eyes and string also snowballs. 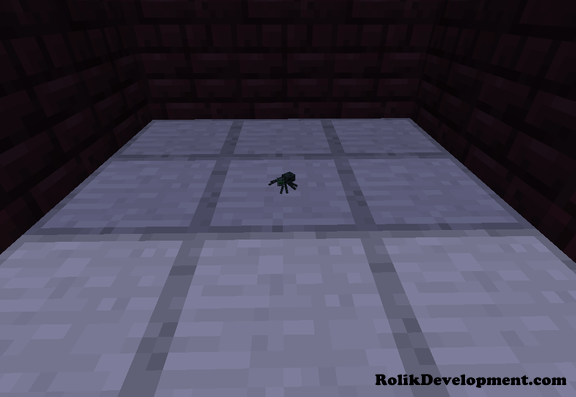 Spider spawns in any cold biomes in the overworld and has 20% of spawning. 1.Mob Agressor - can make any hostile mobs fight, except for ghasts!. 2.Voodo Spider's Eye - no uses or abillities yet, dropped by Voodo Spider. 3.Blaze Spider's Eye - no uses or abillities yet, dropped by Blaze Spider. 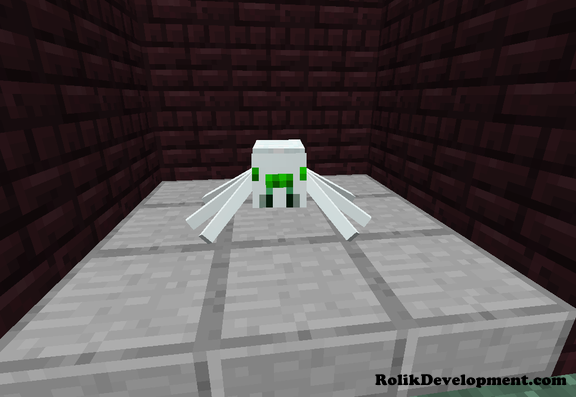 4.Slime Spider's Eye - no uses or abillities yet, dropped by Slime Spider. 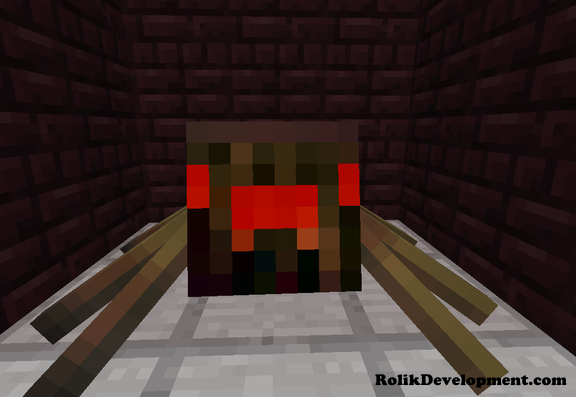 5.Magma Spider's Eye - no uses or abillities yet, dropped by Magma Spider. 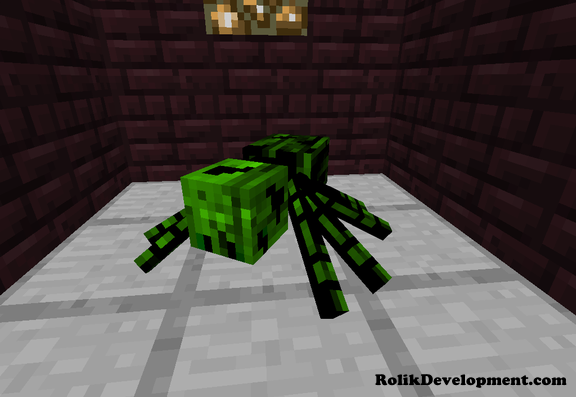 P.s these spiders can also spawn as a jockeys with some mobs, like creepers, zombies and much more!